Happy Holidays! And our END-OF-YEAR APPEAL! Dear Friends, Colleagues, and Supporters! Greetings! with warm wishes for this holiday season and a fulfilling and happy new year ahead! It has been a busy and exciting season at Voices From War, culminating earlier this month with our fabulous WINTER READING! Another CONGRATULATIONS to our writers and the skill with which they shared their stories on December 10th. All ten readers were participants this fall in our Voices From War workshop hosted by the 14th Street Y in Manhattan. And it was also exciting to welcome a group of participants attending from our collaboration in the Bronx! As we wrap up the year, thinking back and looking forward, we offer thanks to all of you who have supported Voices From War in so many ways this year, with your time, your words and deeds, your valuable contributions. If you have not made a donation to Voices From War this year, please consider making a tax-deductible contribution to help support our workshops and programming. We cannot offer our signature quality instruction and engaging readings without you – our supporters, our audience, all of you, both veterans and civilians, who care about the stories our veterans have to tell and the community in which discussions, reading, and writing grow. A few highlights from 2016! 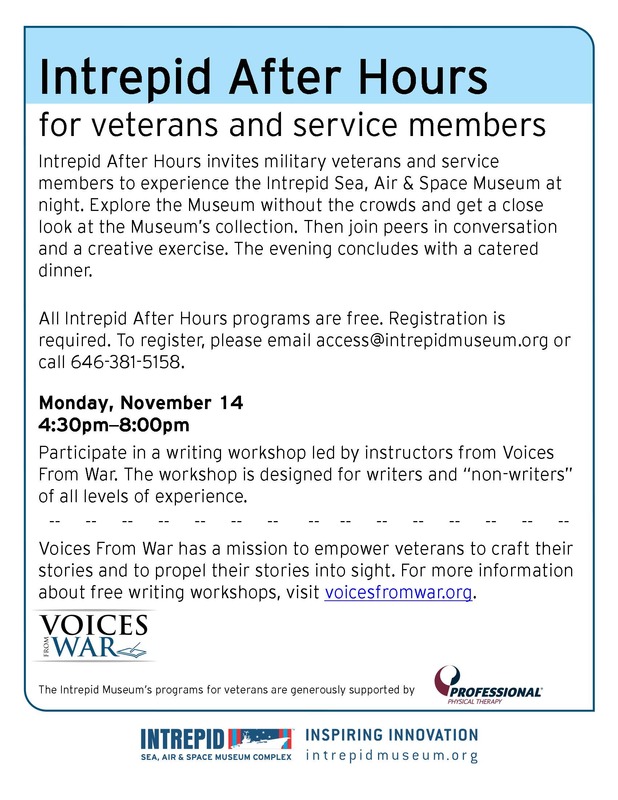 The INTREPID Sea, Air & Space Museum: On November 14th, we were thrilled to run a stand-alone Voices From War writing workshop (part of Intrepid After Hours) on the historic Intrepid! The Rona Jaffe Foundation: We are grateful for new grant support from the Rona Jaffe Foundation! Poets & Writers: We are grateful for continued support from Poets & Writers’ Readings & Workshops program! You can also read a short piece about part of my (Kara’s) personal story in Poets & Writers Magazine (Nov/Dec 2016). CONGRATULATIONS to our instructors and all of our participants on their writing accomplishments! In the NEW YEAR, we’ll be working to bring you a better forum on the website for keeping up with Voices From War participants’ published work, as well as more opportunities to share what they’ve been writing! THANK YOU to Nate Bethea for his two and a half years of dedication as co-instructor at the 14th Street Y! And THANK YOU to Jeremy Warneke for a fabulous first year of collaboration – The Craft of War Writing in the Bronx! THANK YOU to the Morris Park Public Library and the Bronx Council on the Arts for support for The Craft of War Writing; and THANK YOU for support in Manhattan from our host the 14th Street Y! YOUR SUPPORT and tax-deductible DONATIONS MAKE A DIFFERENCE! We hope you will consider making a tax-deductible contribution as we close 2016, or even a monthly recurring donation throughout 2017, whatever your giving level. 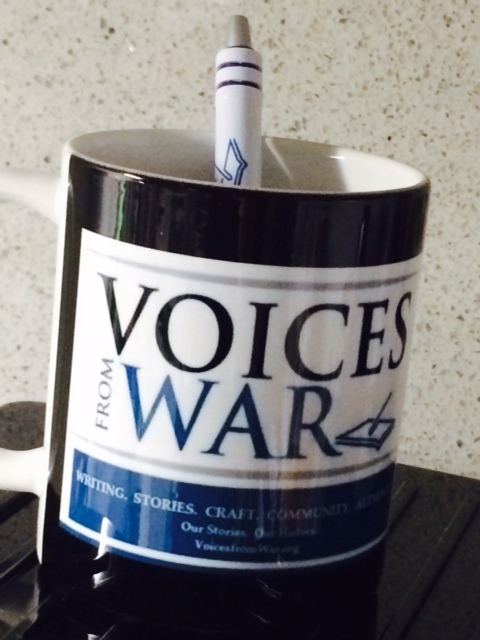 THANK YOU to each of you for your support for Voices From War and veteran stories! Here’s to a healthy and fulfilling 2017! Featuring original writing by Voices From War students. Come together to hear these talented veterans share their stories. 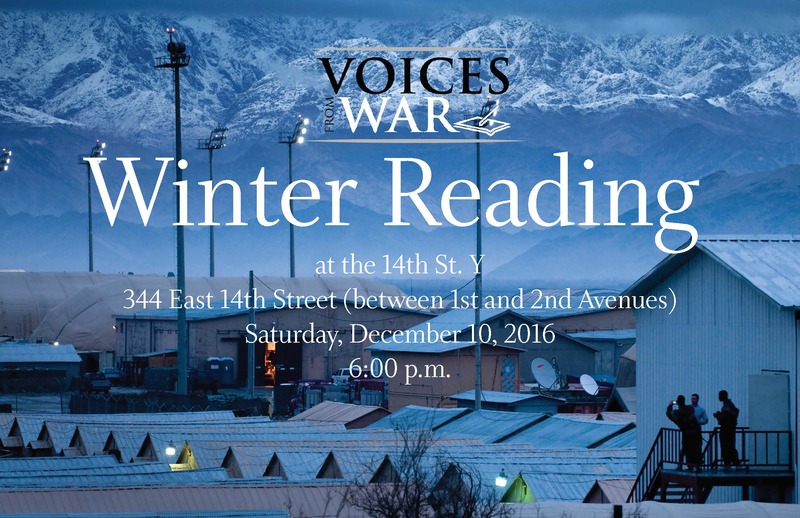 Our WINTER SALON highlights new work from talented veterans in the Voices From War Fall 2016 workshop at the 14th Street Y! On GIVING TUESDAY, please consider supporting Voices From War’s workshops and programming by making a tax-deductible donation through our Fiscal Sponsor, FRACTURED ATLAS. We rely on your support! THANK YOU! We look forward to seeing you on Saturday, December 10th! RESERVE YOUR TICKETS (through Eventbrite) NOW!